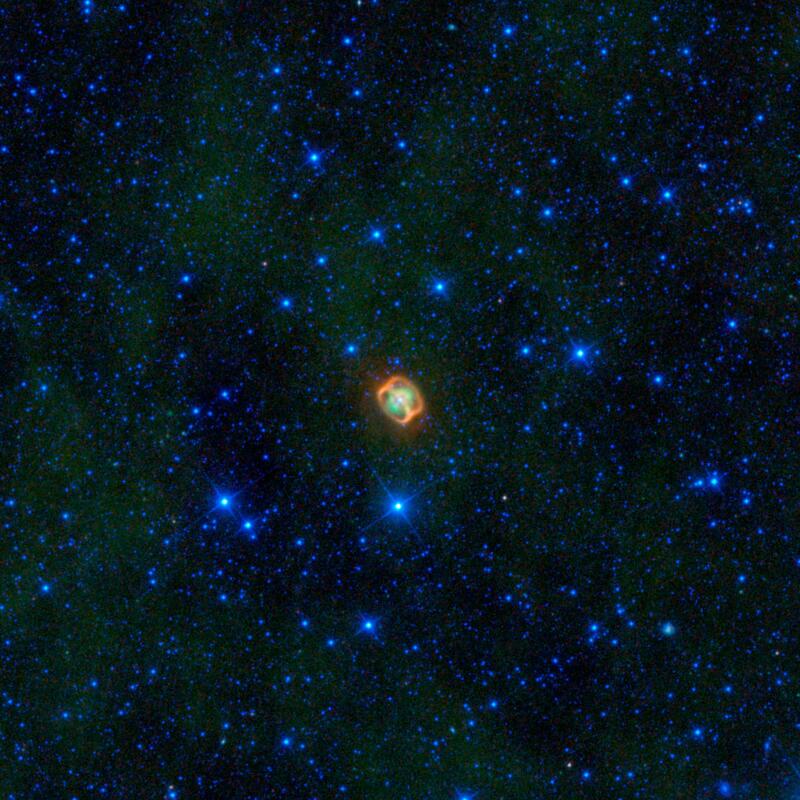 A colorful creature in a starry sea stands out in this image from NASA's Wide-field Infrared Explorer, or WISE. The image shows infrared light that has been assigned visible colors we see with our eyes. 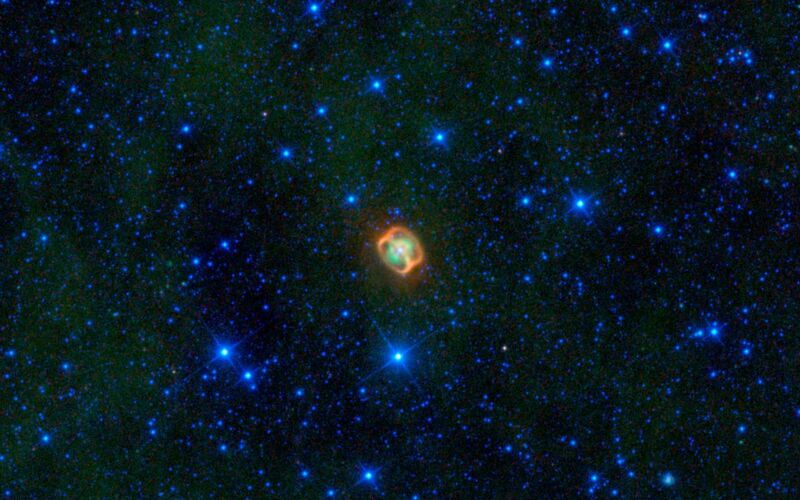 The jellyfish-looking object is actually a very close pair of dying stars (white) surrounded by their shed material (green), and two very unusual dust rings (orange) discovered by WISE. The object, named NGC 1514, is what is termed a planetary nebula. These are dying stars similar to our sun, that blow off their outer layers, sometimes forming beautiful, perfectly round orbs, and sometimes colorful butterfly shapes. In the case of NGC 1514, astronomers think there are two central stars orbiting each other; WISE cannot distinguish between the two stars, so only one white dot is seen. One star is an aging giant a bit warmer than our sun; the other was an even larger star that has already transformed into an ultra-hot white dwarf. 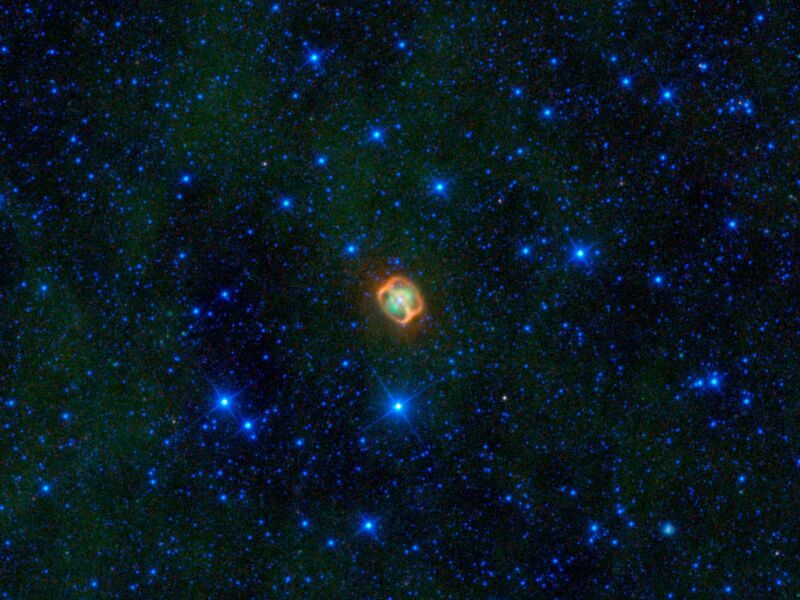 The unusual rings, which are not quite like anything ever seen before around a planetary nebula, are thought to have formed when jets of material that were ejected from the white dwarf hit the walls of a bubble of dust around the stars. 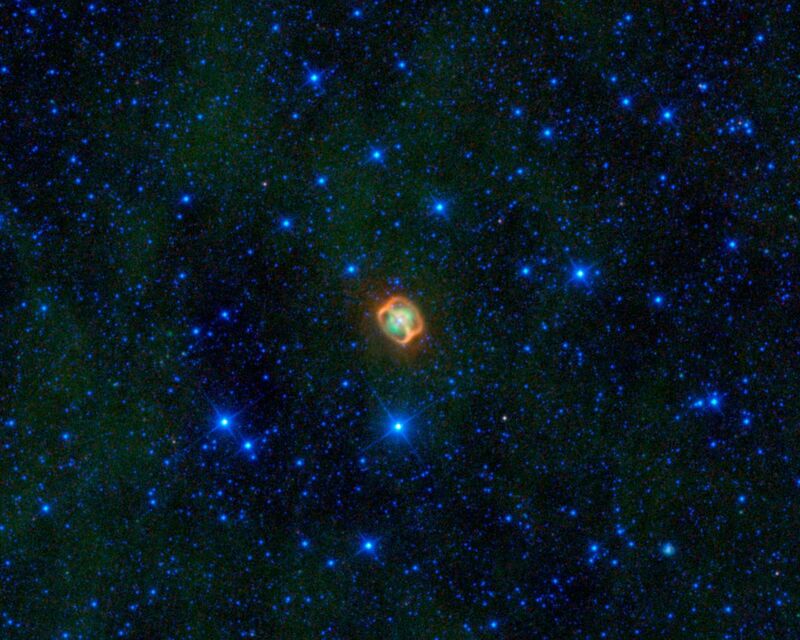 This bubble had previously been blown away from the giant star. NGC 1514 was discovered in 1790 by Sir William Herschel, who was surprised to find what he called a "shining fluid" around the object. He had originally thought that it and all the other fuzzy-looking things he saw in the sky were clusters of stars, and that the telescopes he had were just not powerful enough to clearly see the individual stars. The discovery of NGC 1514 convinced Herschel that these fuzzy blobs were actually an unexpected astronomical phenomenon. Among this new class of objects were the "planetary nebulae" like NGC 1514 -- a term he had coined earlier to reflect their round, planet-like shapes. NGC 1514 is located roughly 800 light-years away in the constellation Taurus, about 8 degrees (the width of a fist held at arm's length) away from the Pleiades star cluster. In this image, infrared light with a wavelength of 3.4 microns is blue; 4.6-micron light is cyan; 12-micron light is green; and 22-micron light is red. JPL manages the Wide-field Infrared Survey Explorer for NASA's Science Mission Directorate, Washington. The principal investigator, Edward Wright, is at UCLA. The mission was competitively selected under NASA's Explorers Program managed by the Goddard Space Flight Center, Greenbelt, Md. The science instrument was built by the Space Dynamics Laboratory, Logan, Utah, and the spacecraft was built by Ball Aerospace & Technologies Corp., Boulder, Colo. Science operations and data processing take place at the Infrared Processing and Analysis Center at the California Institute of Technology in Pasadena. Caltech manages JPL for NASA.